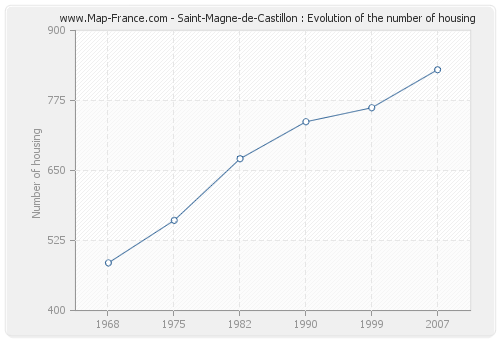 The number of housing of Saint-Magne-de-Castillon was estimated at 830 in 2007. These accommodation of Saint-Magne-de-Castillon consist of 749 main homes, 26 secondary residences and 55 vacant accommodation. Area of Saint-Magne-de-Castillon is 13,87 km² for a population density of 128,84 habs/km² and for a housing density of 59,84 housing/km². Here are below a set of graphic, curves and statistics of the housing of the town of Saint-Magne-de-Castillon. Must see: the population data of Saint-Magne-de-Castillon, the road map of Saint-Magne-de-Castillon, the photos of Saint-Magne-de-Castillon, the map of Saint-Magne-de-Castillon. The number of housing of Saint-Magne-de-Castillon was 830 in 2007, 762 in 1999, 737 in 1990, 671 in 1982, 561 in 1975 and 485 in 1968. 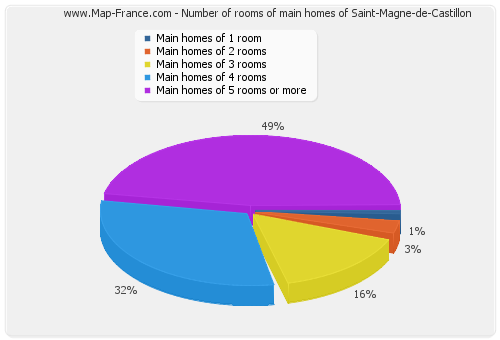 In 2007 the accommodations of Saint-Magne-de-Castillon consisted of 749 main homes, 26 second homes and 55 vacant accommodations. 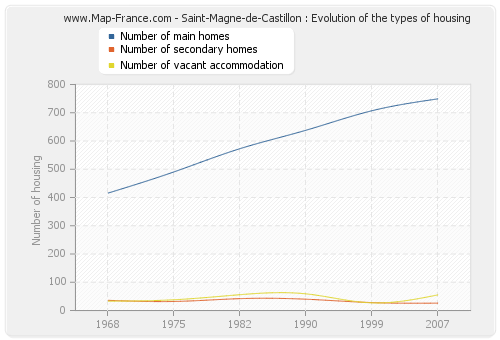 The following graphs show the history of the number and the type of housing of Saint-Magne-de-Castillon from 1968 to 2007. The second graph is drawn in cubic interpolation. This allows to obtain more exactly the number of accommodation of the town of Saint-Magne-de-Castillon years where no inventory was made. The population of Saint-Magne-de-Castillon was 1 787 inhabitants in 2007, 1 754 inhabitants in 1999, 1 640 inhabitants in 1990, 1 531 inhabitants in 1982, 1 455 inhabitants in 1975 and 1 275 inhabitants in 1968. Meanwhile, the number of housing of Saint-Magne-de-Castillon was 830 in 2007, 762 in 1999, 737 in 1990, 671 in 1982, 561 in 1975 and 485 in 1968. 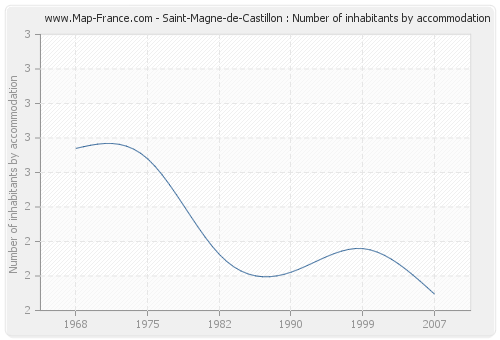 The number of inhabitants of Saint-Magne-de-Castillon per housing was 2,15 in 2007. The accommodation of Saint-Magne-de-Castillon in 2007 consisted of 810 houses and 16 flats. 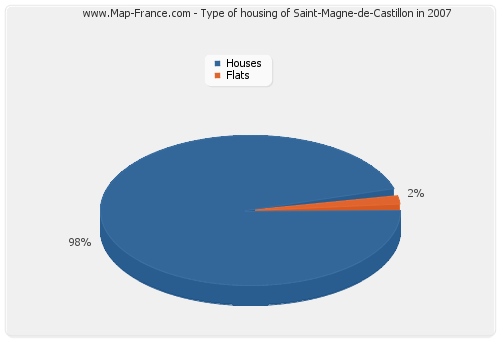 Here are below the graphs presenting the statistics of housing of Saint-Magne-de-Castillon. 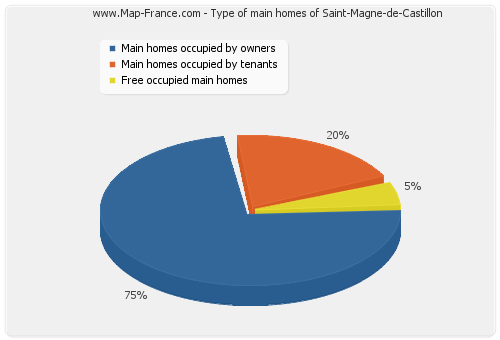 In 2007, 564 main homes of Saint-Magne-de-Castillon were occupied by owners. 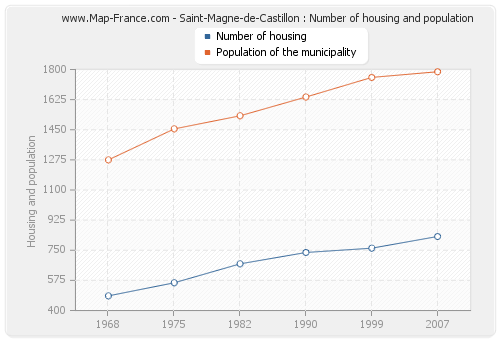 Meanwhile, 749 households lived in the town of Saint-Magne-de-Castillon. 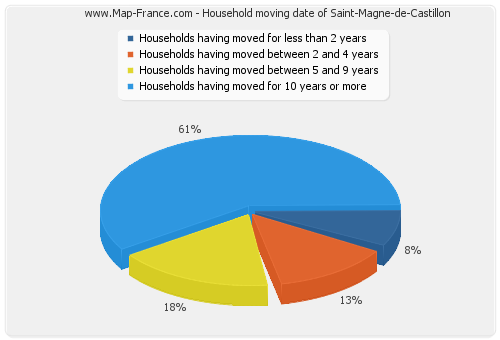 The following graphs present the statistics of these households of Saint-Magne-de-Castillon.